A literary watering hole for the bookthirsty. 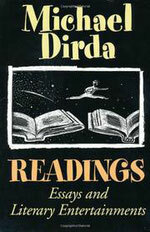 Don't read Michael Dirda if you're culling books! A few months ago I gathered up enough courage to cull some books from my overflowing shelves. 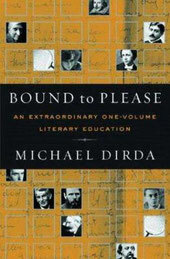 I was doing pretty well and had two boxes full when Michael Dirda’s Bound to Please. An Extraordinary One-Volume Literary Education caught my eye. It’s been years since I read this, so I thought I’d just page through it for a few minutes. It ended up being toted around the house for the following month because this is one of those fabulous books you can just open up to any random page and begin reading. I also had Readings. Essays and Literary Entertainments, so that soon joined Bound to Please (love the title by the way, with its triple meaning) on the coffee table and nightstand. I’m a sucker for books about books so it wasn’t long before it occurred to me to see if he’d written even more – and, oh glory, I found Browsings, which I promptly ordered. He has written more than these three books, but I do practice moderation now and then, and so did not order them all. I could not, however, resist buying William Morris. A Life for Our Time by Fiona MacCarthy, due to Mr. Dirda’s essay on the biography of this Renaissance man (in Bound to Please). Now, as any half-crazed book lover knows, the one thing that is even better than reading books is reading books about books. And Michael Dirda is at the pinnacle of this category. To say that he’s well-read would be the understatement of the century – it’s like the man has a well-stocked bookstore residing between his ears. His writing is personal and entertaining and he seems to write about every genre, from classics to sci-fi to obscure authors I’ve never heard of, and about book collecting, bookish events, anything to do with books, really. In short, he makes you want to head for the nearest used bookstore immediately. 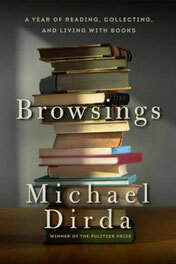 In the introduction to Browsings, Mr. Dirda says not to read more than two or three (make a note of these numbers) essays at one sitting, and I did mean to follow his recommendation so that the book would last longer. But the actual problem with Michael Dirda’s books is not the fact that I can’t stop reading them, but because he writes so wittily and enthusiastically about books and authors, I end up feverishly scribbling dozens of titles down which I absolutely must have. So you see where this is going. And you can probably guess how much further I got with that ridiculous culling project. If my shelves overflow, well, I’ll just store the extra books in the basement like Michael Dirda does. The essays in Browsings were first published by The American Scholar and can be read here (‘bookish pets’ is a very amusing one).